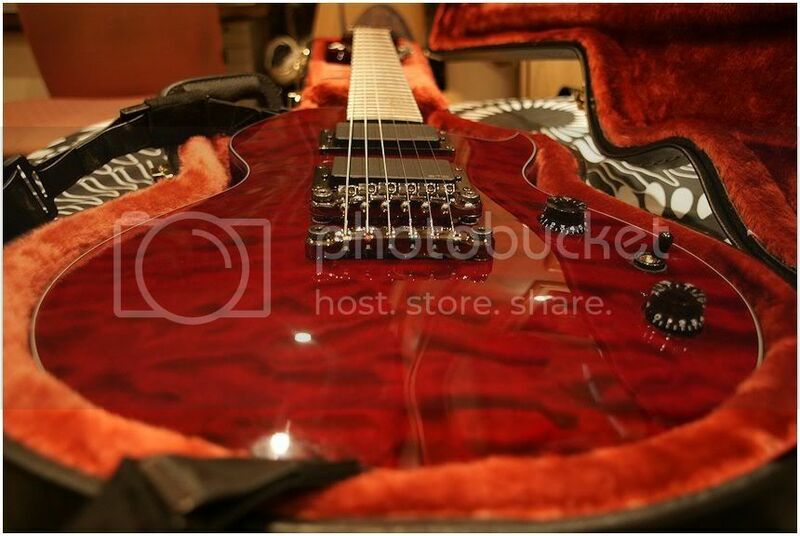 Vigier Excalibur Supra for me, the best guitar I've ever laid hands on! Hi all. I've been mostly lurking here for a while, but I figured I'd chime in. I got to play a Nash strat (don't know the exact model) last summer and was totally blown away. Great guitar. Here is my most recent addition to the collection: a Reverend Unknown Hinson Signature ('11). It is made of Kornia (used by Gibson in the 50's -- tone similar to mahogany) and has P-90 pickups plus the "Reverend secret weapon:" a bass contour knob that makes it a very versatile guitar. I keep meaning to put new pickups in this guitar but as it is it is an interesting axe. 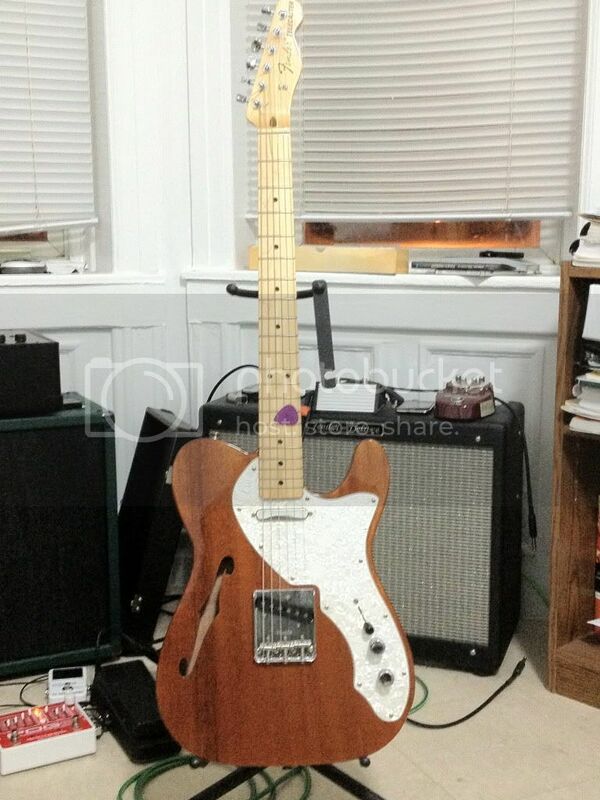 It's a '69 Mexican Tele reissue (c. 2005). Made of mahogany. 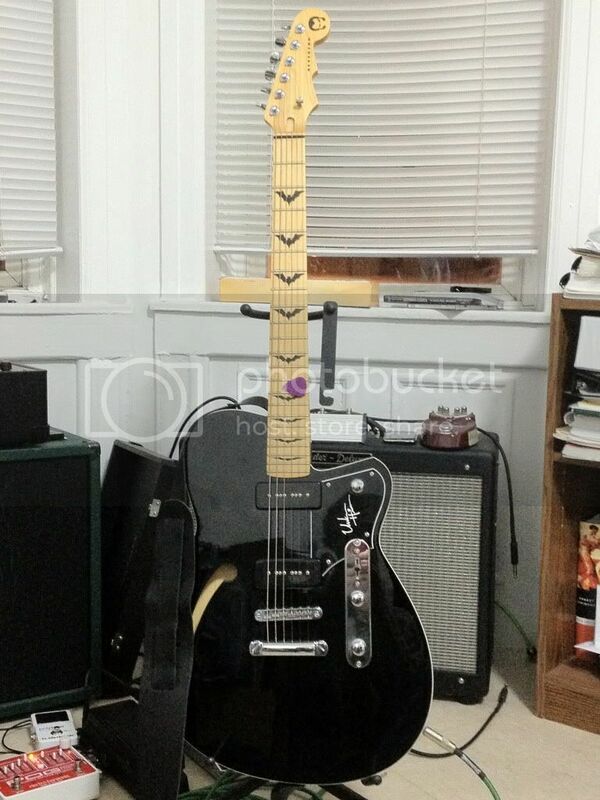 Quite unlike any other tele. This was my first real electric guitar. It is a standard Mexican Strat (c. 2003) but I put some EMG pickups in it a few years ago and really love the sound. When I had that done I also had my 2nd tone knob turned into a volume boost knob. Pretty cool. Pedals. From left to right: EHX Deluxe Memory Man, T.C. 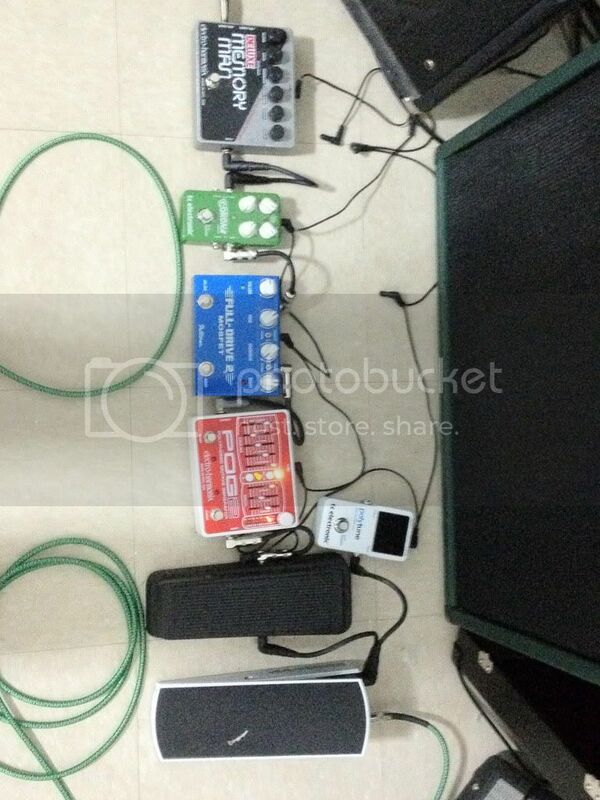 Electronic Corona Chorus, Fulltone Full-Drive 2 Mosfet, EHX POG2, Dunlop Crybaby Wah, Ernie Ball VP Jr., T.C. Electronic Polytune. And amps. 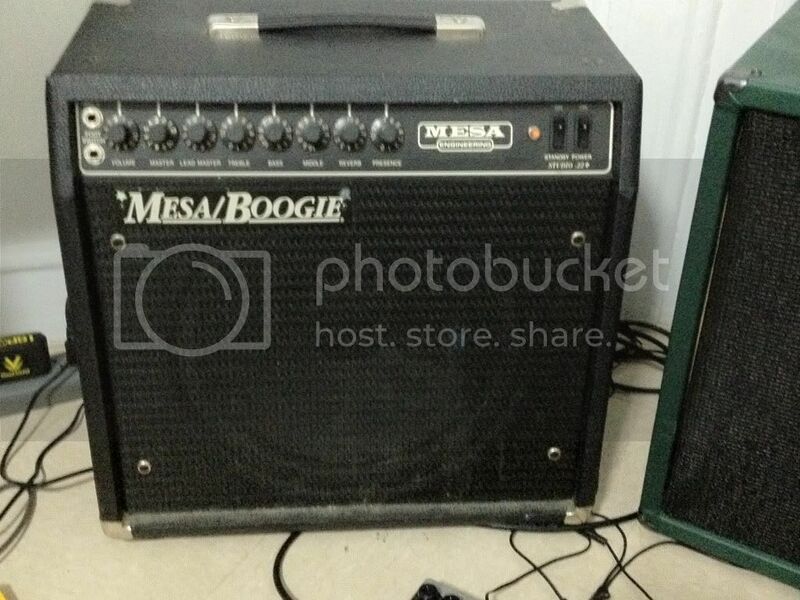 Here's my Mesa/Boogie Studio .22+ (c. ????) and Fender Deluxe (made sometime in the 90s or early 2000s). Also pictured is a homemade cab that I got when I purchased the Fender. 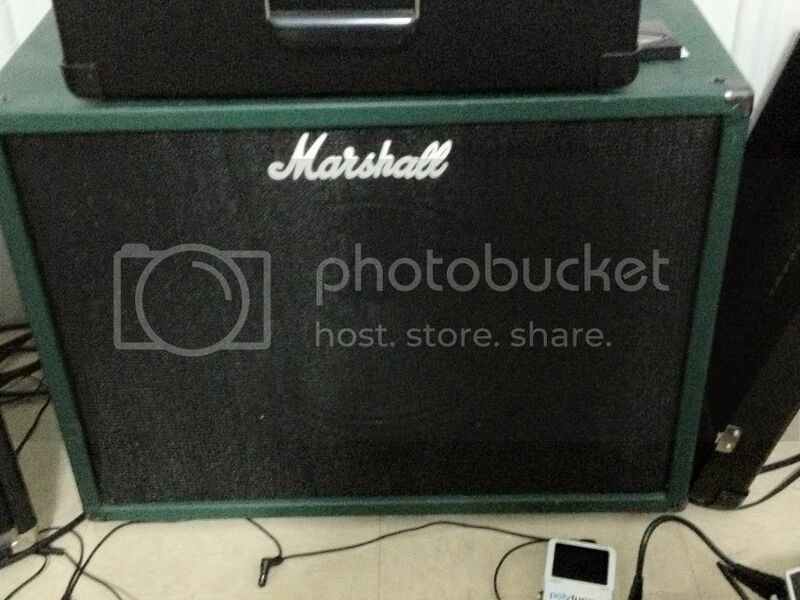 It isn't actually a Marshall, it just bears the logo. 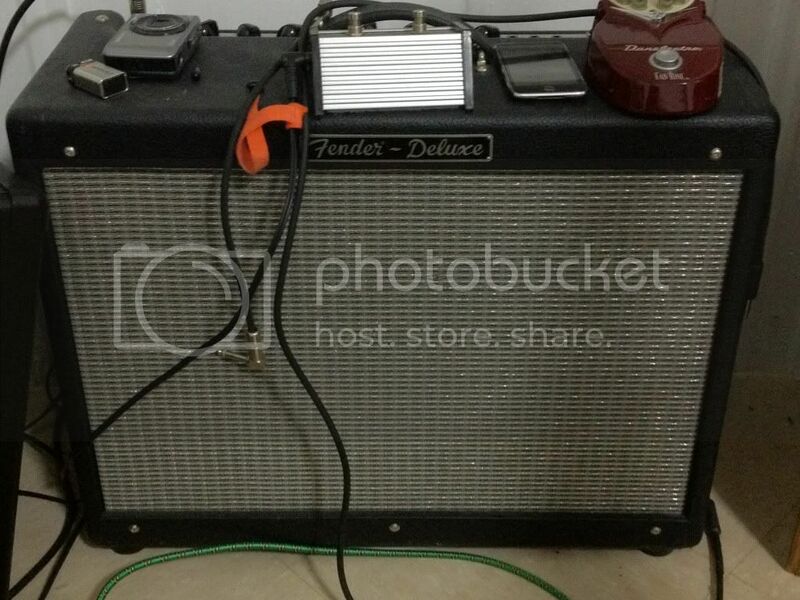 It is actually a copy of a Fender extension cab and has the same speaker as the Deluxe. i have a mci intertek sx 3000 made in 1983 the trim is locked down because you CANNOT tighten the tention springs what so ever lol. and i also have my pride and joy! my jackson kelly ke3 pro with a floyd licencend trem (i plan on buying a true floyd) she has to seymore duncans (i plan on getting an evo II for the bridge >:] ) shes my baby!! i call her Jackie hehe shes a beautiful transparent red! 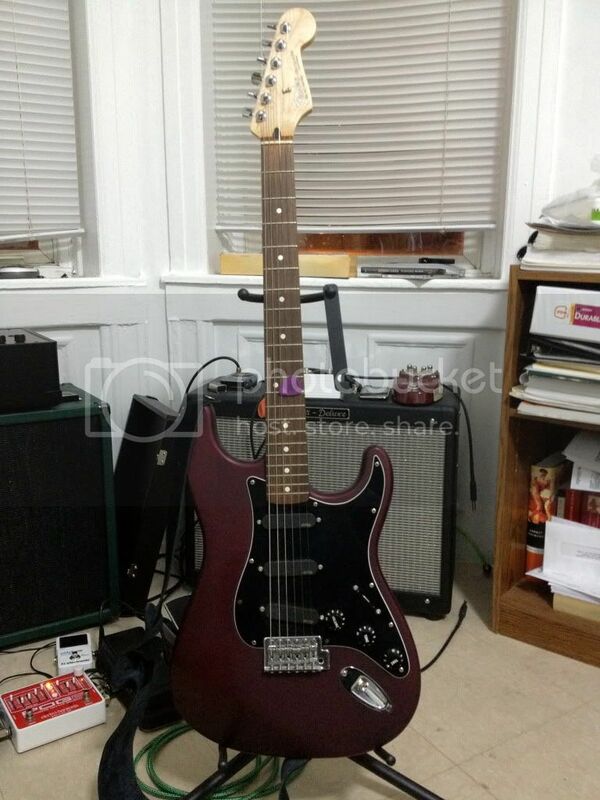 Fender US stratocaster black w/ rosewood board. Ibanez UV77 Multi Color 'mkr'. 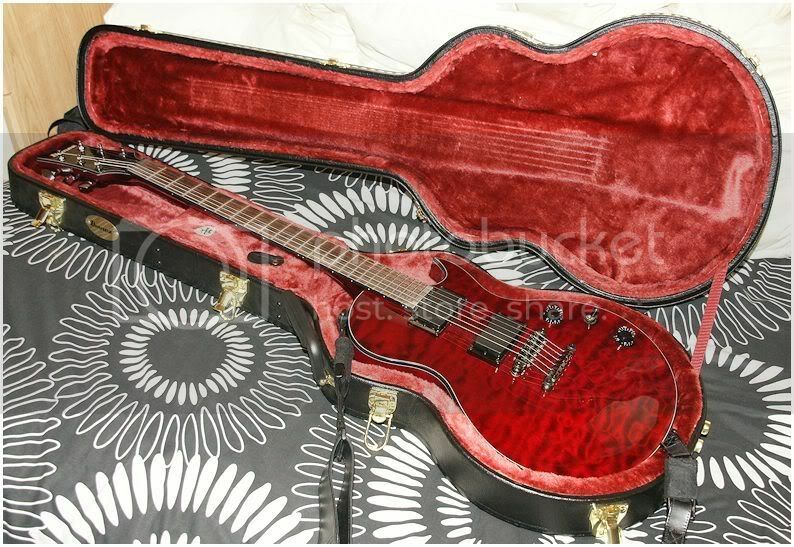 And that's it Im looking forward in buying the Line 6 Jtv-69US soon. I think thats all of 'em. How the hell do you upload pictures you've taken onto the site? I can't find instructions anywhere on the board. Somehow I think it's going to be complicated and my fragile little mind will be left all confused and alone. "[...] You must link to an image stored on a publicly accessible web server, e.g. http://www.example.com/my-picture.gif" onclick="window.open(this.href);return false;. You cannot link to pictures stored on your own PC (unless it is a publicly accessible server) nor images stored behind authentication mechanisms, e.g. hotmail or yahoo mailboxes, password protected sites, etc. To display the image use the BBCode [img] tag." Bryceybhoy wrote: How the hell do you upload pictures you've taken onto the site?